Organic Fruit, Veg & More to Your Door! Flour, yeast and other baking essentials for all you Domestic Gods and Goddesses! Delicious in fruit pies, shakes, porridge, savoury dishes etc. Organic stoneground strong 5 seed malted mix is a sophisticated blend of sunflower seeds, pumpkin seeds, golden linseeds, flax seeds & fennel seeds. These seeds can add variety to your diet and give your health a boost. Linseeds have proved to be an important source of omega-3 fatty acids. 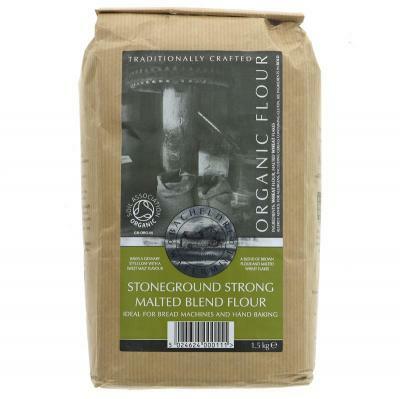 Organic stoneground strong malted blend flour makes an excellent granary type loaf. a blend of stoneground brown flour and specially malted, rolled wheat flakes. this produces a wholesome loaf with a sweet malted taste and crunchy texture. Organic whole nutmeg - keep away from pets, especially dogs, and children! See safety warning below. Grind when you need it, for maximum flavour. Delicious in porridge, milk shakes, rice pudding, fruit pies, moussaka etc. SAFETY: Nutmeg is highly neurotoxic to dogs and causes sezures, tremors, and nervous system disorders which can be fatal. Nutmeg's rich, spicy scent is attractive to dogs, which can result in a dog ingesting a lethal amount. Food / drink preparations which contain nutmeg should never be given to dogs. Nutmeg is UNSAFE to humans in doses larger than normal amounts found in foods. Side effects such as thirst, dizziness, nausea, vomiting, feelings of pressure in the chest or stomach, dry mouth, stomach pain, and many other problems might occur in some people. More serious side effects might include hallucinations, seizures, and death.